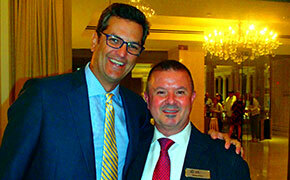 ABC Global Services CEO Eric Altschul with Klayton Killion, ABC Global EVP Hotel & Supplier Relations. AeroMexico’s Market Manager Cesar Alvarenga and Regional Sales Director Michele Martinson. Look for an ABC Global airline product announcement in the months to come. 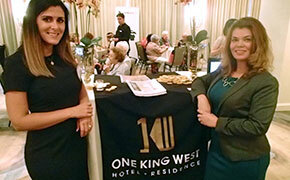 Deborah Forgione, Senior Sales Manager and Meneka Virmani Ganguly represented Toronto’s popular One King West Hotel. Toronto’s ever-gracious Omni King Edward Hotel was the grand setting as ABC Global Services personally invited key agents, corporate account managers and operations personnel to get ‘UpClose’ with over 30 of ABC’s preferred hotel and industry partners. 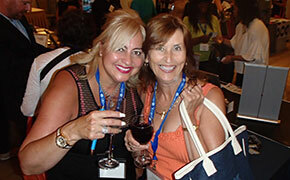 ABC specializes in hooking up agents and hotels to their mutual benefit. The ABC Premier Hotel Program gives agents and their clients special access – including best available rate or better, exclusive privileges and block space -- at over 42,000 hotels around the world. The company’s ezBOOK portal gives agents access to an amazing 600,000 hotels. And ABC’s newest division, hotelCONNEX, aims to remove hotel-sourcing pain points for TMCs. With that background, it’s not surprising that some of the biggest names in the hotel world were on hand, including Hilton, Hyatt, Wyndham, Choice, Best Western, Accor, Marriott, La Quinta – and of course host Omni Hotels. That’s important, Altschul told Open Jaw, with more millennials looking to travel agents to help create memorable journeys. Open Jaw had the pleasure of touring the iconic and wonderful Omni King Edward Hotel, which has been lovingly looked after with tens of millions of Omni’s cash. Well described by one reviewer as ‘old world beautiful,’ the property looks great, its 300 rooms spacious and decorated with nods to the past as well as all the latest luxury hotel trimmings. Director of Sales Matthew Desira proudly showed off the property, pointing out where Richard Burton proposed to Elizabeth Taylor (for the second go-round), and where Hemingway once sat on the stairs as he wrote memoirs during a 2-month stay. He saved the best for last, welcoming guests into the 17th floor Crystal Ballroom, once – and now once again – one of Toronto’s most fashionable spaces.